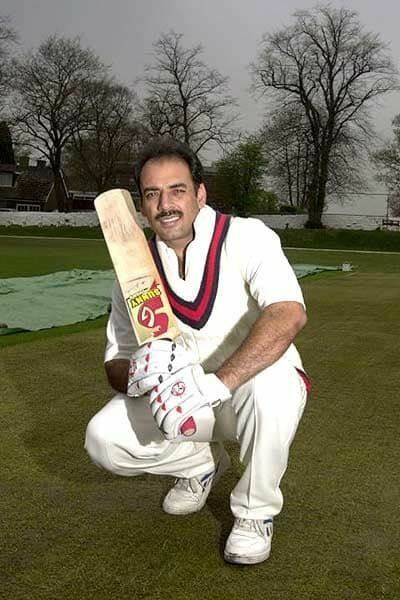 Ajay Kumar Sharma pronunciation (born 3 April 1964 in Delhi) is a former Indian cricketer. Sharma was a prolific run-maker in first-class cricket, mainly for Delhi, scoring over 10,000 runs at the high average of 67.46. Given a minimum qualification of 50 innings, only three players (Sir Donald Bradman, Vijay Merchant and George Headley) have bettered this average in first-class cricket. In the Ranji Trophy, Sharma scored a record 31 centuries and his batting average of approximately 80 in this competition is second only to Vijay Merchant. In the 1996-97 season, he became only the third player to score over 1000 runs in a Ranji Trophy season. He played in six Ranji Trophy finals for Delhi scoring centuries in four of them, but only twice ended up on the winning side (1985–86 and 1991–92). Sharma also regularly represented North Zone in the Duleep Trophy. Despite his domestic scoring record, Sharma only played one Test match for India - against the West Indies in January 1988. He played 31 One Day Internationals for India from 1988 to 1993. In December 1988, he scored back-to-back fifties against New Zealand, but he did not reach those heights again except for a 59 not out (his highest ODI score) against Zimbabwe in March 1993. He finished with 424 runs at a batting average of 20.19. Sharma also took 15 wickets using his left-arm spin with a best of 3/41 against Australia in October 1989.